Once in Jamaica geography often surprises first-timers to the island. The images used in advertising are so focused on our beaches that other striking features of our landscape come as an unexpected pleasure for many visitors. Jamaica is divided into 14 geographical and political areas called parishes. All the parishes are blessed with physical features that make them engaging. There's hardly a place in Jamaica where you cannot stand and see the hills. They run like a backbone across the centre of the island from west to east, with a myriad of branches extending north and south. 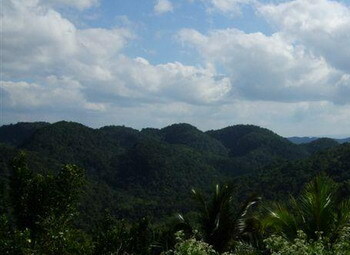 Nearly half of Jamaica's surface is over 1000 feet above sea level. The picture above shows the Santa Cruz Mountains as seen from Black River bay. The highest mountain range is the one famous for its coffee - the Blue Mountains. These tower up to the Blue Mountain Peak at 7,402 feet, and span the eastern parishes of St. Andrew, St. Thomas and Portland. Other peaks in the Blue Mountains are Sugar Loaf Peak in Portland (over 7,000 ft), Mossman's Peak in St. Thomas (over 6,700 ft) and St. John's Peak in St. Andrew (6,332 ft). Also in the east are Portland's John Crow Mountains, reaching over 3,750 feet at their highest point. The eastern mountains are made of mainly hard, igneous rocks. Then there's the central range of mountains. 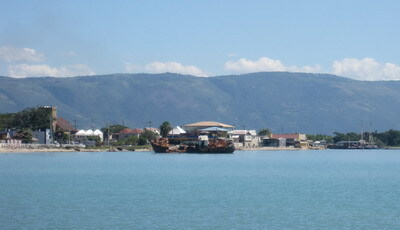 These begin west of Stony Hill, St. Andrew, extend through St. Mary and St. Catherine (Mount Diablo), and continue westwards towards the Cockpit Country, a unique place in Jamaica geography. 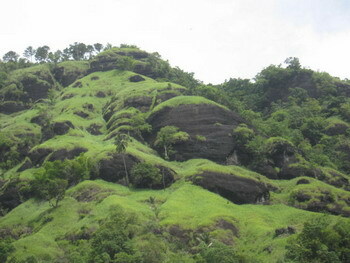 Formed from limestone, the Cockpit Country is marked by thousands of deep valleys and cone shaped hillocks. There are many sinkholes, underground streams and caves due to the fact that limestone cannot retain water on its surface. Seen from above, the Cockpit Country resembles a huge green egg-carton turned upside down! St Elizabeth and St. James. The western mountain range stretches through Westmoreland and Hanover. The Dolphin Head Mountain reaches 1789 feet, and Birch's Hill 1809 feet. Other important mountains (some of them independent of the west-east backbone) are Don Figuerero, May Day and Carpenters Mountains in Manchester, Dry Harbour in St. Ann, Mocho and Bull Head in Clarendon, and the Santa Cruz Mountains here in St. Elizabeth, of which the highest point is Top Rock at Munro College, standing 2,560 feet. The first inhabitants of Jamaica (the Tainos) called it "Land of Wood and Water", due to the abundance of trees and rivers all over the island. The rivers of Jamaica begin in the mountains. Since the mountains run primarily from west to east, the rivers generally flow to the north and the south to reach the coast. Those that flow south tend to be longer than those flowing north, as the mountains in the south are further away from the coast than those in the north. The Plantain Garden River in St. Thomas is the only one which flows west to east. For years it was thought that the Black River in St. Elizabeth was the longest, at 44 miles. The Rio Minho in Clarendon is now known to be the longest at 57.5 miles, although much of it is dry at certain times of year. Some people think it should be called the longest river bed, not the longest river! 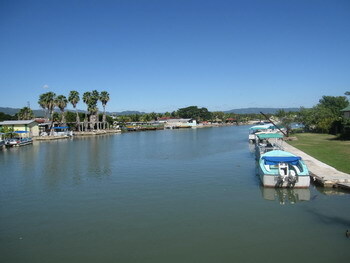 Most of Jamaica's rivers are not navigable for any distance - the Black River holds the distinction of being navigable up to about 15 miles from the river mouth. Safari tours up the Black River to see its crocodiles and birds are a rewarding nature experience. he Rio Grande is a large, beautiful river in Portland which runs through some of the most untouched scenery on the island. Rafting on this river has been a practice for years. 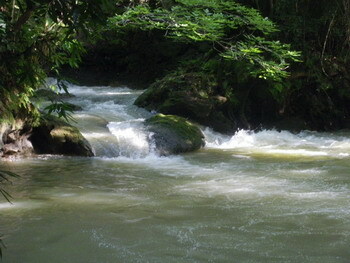 The Martha Brae River in Trelawny and the White River in St. Ann are also popular for rafting. Our rivers give rise to waterfalls of all sizes as they flow through the hills. The most famous are Dunns River Falls in Ocho Rios, YS Falls in St. Elizabeth, Reach Falls, Somerset Falls and Mayfield Falls. Some of our rivers have retained their Spanish names - Rio Cobre, Rio Sambre, Rio Nuevo, Rio Bueno. The plains of Jamaica lie to the south. Georges Plain in Westmoreland, Pedro Plains in St. Elizabeth, Vere Plain in Clarendon, St. Jago in St. Catherine, and Liguanea Plain in Kingston and St. Andrew. They are all alluvial plains, meaning that they were formed by the sediment deposited by rivers flowing from highland areas, over a long period of time. 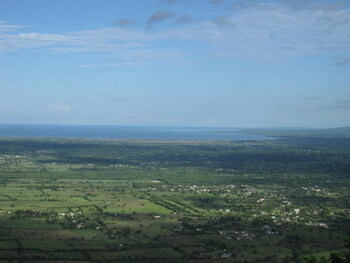 These vast areas of flat land were the perfect location for sugar plantations to flourish, driving the Jamaican economy and the need for slaves in the 17th to 19th centuries. Jamaica geography is very diverse given the size of the island (146 miles long, 51 miles wide at its extremes). It is therefore easy to explore contrasting landscapes over a short period of time. I'm so proud to live in this beautiful country, with all the experiences it offers. This next page gives you the details on where Jamaica is located.